Welcome back, my friend, to another sketch challenge with the Paper Craft Crew! It has been so much fun to see so many fabulous cards submitted each week; I love seeing all the wonderful cards; thank you so much for taking part in our challenges. It’s funny – I resisted buying the Wonderland set, and now that I have it, I can’t stop using it! I decided to work with purples this time; it’s such a rich colour. I started with a panel of Whisper White cardstock, and with Sponge Daubers inked on Perfect Plum towards the center, and Blackberry Bliss around the edges. I left it very light in the middle, to achieve a ‘backlit’ look for the trees. I stamped the trees in Memento Black ink full strength in the middle of the panel, the on each side after stamping off, so that they weren’t full-strength ink. I placed a strip of the Winter Wonderland Designer Vellum paper (on sale in this week’s Weekly Deals!) across the bottom of the panel. I stamped the sentiment in Versamark ink onto Blackberry Bliss cardstock, then heat embossed it with Gold Embossing Powder. I used the Tags & Labels Framelits to create the ends in both the Blackberry Bliss and the Gold Foil Paper. 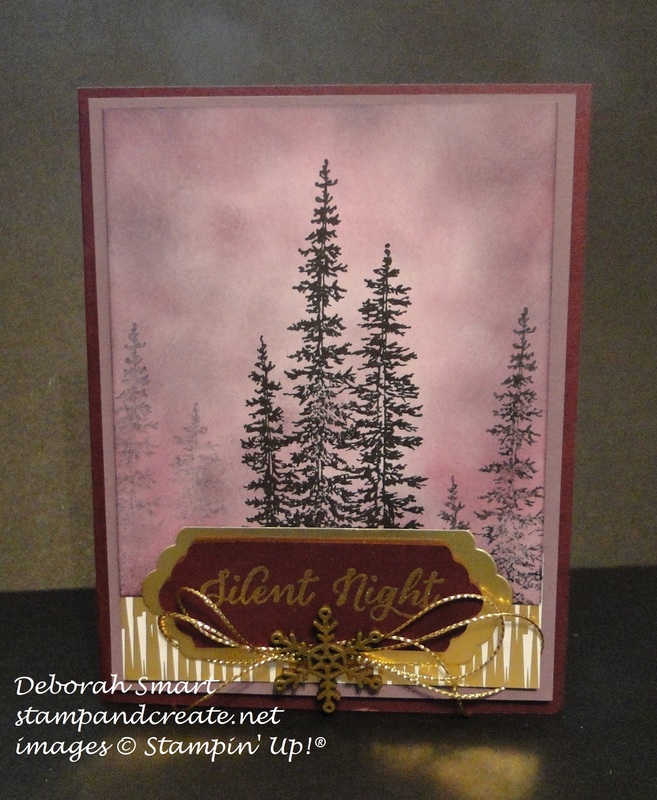 I layered both of these together, and added them to the card using Stampin’ Dimensionals. I made some loops of the Gold Cording Trim, then glued them to the back of the Snowflake Element, and attached it below the sentiment using Glue Dots. The stamped panel was attached to a layer of Perfect Plum cardstock, which was then attached to the card base of Blackberry Bliss cardstock. I think it’s a classy looking card, that came together quite quickly. I hope you’ve enjoyed seeing it – if you have time, I always love to read your comments if you care to leave one. Now I hope you’ll check out the Paper Craft Crew page to see the amazing designs of the rest of the design team, and then join us in this new challenge! Next Next post: Have You Shopped Yet? Deborah, this is gorgeous!! Love the purple background.